Notice the TinkerTry tagline, above. The words home and backup. They're an integral part of my two decade IT career, and a common theme among the 700+ posts here at TinkerTry. I'm always investigating various ways to backup all of my home lab PCs, servers and VMs. I use Veeam Endpoint Backup FREE extensively to protect my extended family and friends. I would like to test its ability to back up to a Veeam v9 Backup & Replication backup repository, on a Synology NAS, or on local storage, see also Superguide: SuperServer home virtualization lab storage tiers, platinum through bronze, how many efficient drives fit inside this tiny chassis?. What would it actually cost me, a vExpert and VCP-DCV, to keep the repository product running in my home lab, which is Veeam Backup & Recovery v9? That centralized repository would hold both my VM backups, and my friends and family PC backups. Well, the pricing is for the enterprise, naturally. That's what I call a showstopper, for the home lab. Good news. 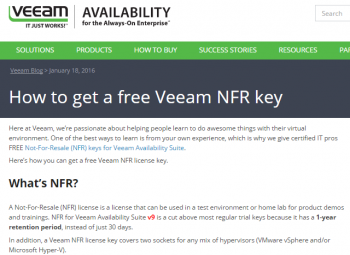 Veeam has updated their existing NFR code download site! Here at Veeam, we’re passionate about helping people learn to do awesome things with their virtual environment. One of the best ways to learn is from your own experience, which is why we give certified IT pros FREE Not-For-Resale (NFR) keys for Veeam Availability Suite. A Not-For-Resale (NFR) license is a license that can be used in a test environment or home lab for product demos and trainings. NFR for Veeam Availability Suite v9 is a cut above most regular trial keys because it has a 1-year retention period, instead of just 30 days. In addition, a Veeam NFR license key covers two sockets for any mix of hypervisors (VMware vSphere and/or Microsoft Hyper-V). If you're a vExpert, VCP, VCAP, VCI, VCDX, VMUG Leader, VTEC, VMCE, MVP, MCSE, MCSA, MCT, Cisco Champion, or PernixPro Member, you may be eligible, for 1 year / 2 sockets. I tried out the link myself, and after filling out the form using my business email address and omitting the comma in Company name "TinkerTry.com, LLC", I was instantly able to download the ISO to give it a go. Thank you for your interest in Veeam Availability Suite 9.0 for VMware and Hyper-V. Your NFR license key is attached. An NFR (Not for Resale) license can only be used for evaluation or demonstration purposes; it is not for production usage. so it's good to be aware that your one year starts with your NFR request date.